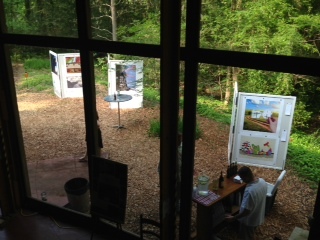 The Spring House Institute in Tallahassee hosted a Fundraiser this past Saturday, April 27th. 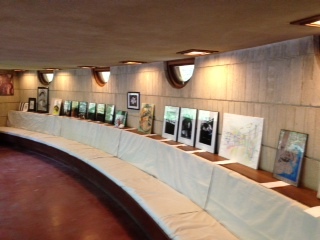 This fundraiser featured a silent auction of artwork from Florida State University’s Department of Art. Attendees of this inaugural fundraiser also enjoyed food and drinks from the Hotel Duval, music by the Fried Turkeys and a screening of Pete Winter’s document about the Spring House restoration with a presentation by Kevin Schweizer, lead architect on the restoration program, about the plans for the future of this project. 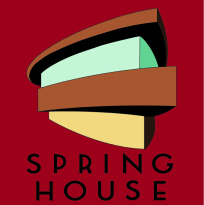 The Spring House is the only private residence in Florida designed and built by Frank Lloyd Wright. This house, designed in 1952 for George Lewis, is the focus of a restoration effort to preserve this local jewel. With the help of community support through fundraising, the Spring House will one day be used for a broad spectrum of classes, workshops, seminars, and other cultural events. Several FSU art instructors took students to the Spring House to work and study over the past few months. During this time the students studied the nature and architecture of the area to create incredible works of art. The Depa rtment of Art faculty and students thoroughly enjoyed working and learning in the Frank Lloyd Wright environment and the students enthusiastically created works for the auction. We look forward to participating in future benefits and many more scholarly projects with the Spring House Institute.